The cooler seasons can typically be a time of less activity. This can lead to feeling weak or fatigued. While exercise and movement are important for people of all ages, it is especially important for aging adults. Engaging in regular activity helps us maintain healthy muscle mass and bone density, and prevent falls making it safer to live alone. Regular physical activity can also reduce the risk of cardiovascular disease by lowering blood pressure. And although arthritic pain tends to increase in the winter for many of us, exercise helps to decrease pain by lubricating joints. Regular exercise can also reduce the symptoms of anxiety, stress and depression. Several studies also confirm that regular exercise can help prevent cognitive decline, making activity all the more important for aging adults susceptible to Alzheimer’s, dementia and memory loss. Here are a some tips to help you stay active all winter long. 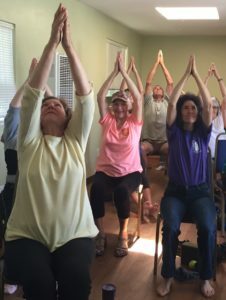 Chair yoga: It’s no secret that yoga increases muscular flexibility and strength, improves balance, nourishes blood and improves cognitive processes. It also helps with chronic pain conditions by easing the stress, anxiety and depression that can create and reinforce pain, making you feel more comfortable in both your mind and your body. Check out Grey Bears three weekly chair yoga classes led by Suzi and Sarah. Join a gym: Many gyms offer senior discounts on memberships, as well as workout classes designed for aging adults, including water aerobics, yoga and movement classes. Getting out of the house, staying active, and engaging with other people have a positive effect on our well-being. Exercise at home: While getting out of the house and interacting with others is a great idea, there’s a lot we can do in our own homes when it comes to exercise. Online classes like Befit’s YouTube Channel are completely free, and yogaglo.com offers a 15 day free trial, and $18 a month gets you access to more than 2,000 streaming online classes organized by duration, style, teacher, and level. Pick up a pair of light free weights at Grey Bears and carve out a short session of your day for a gentle lifting session—even while watching TV! Volunteer: Grey Bears and other nonprofits offer many ways to put your skills and experience to work. From helping in food quality control, the brown bag assembly line and driving a delivery route, to turning the compost tubs, helping in the thrift store, running a register or listing books on Amazon.com – you’ll have fun while helping Grey Bears make a difference in the lives of others. 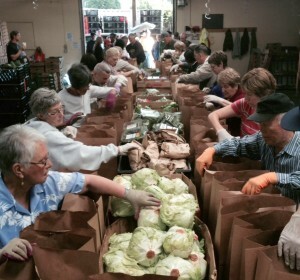 You can also enjoy a home-cooked breakfast or lunch, and take home a bag of groceries. Click here for a simple application form. Other fun activities: There are many activities to engage in that double as fun exercise. Enjoy a walk on West Cliff Drive or Seacliff. Take a movement class like line dancing, or a game of ping pong at Louden Nelson Center. Explore a museum like MAH, Sanctuary Exploration Center or Surfing Museum. While it may be a bit more challenging to exercise during the winter months, these tips offer a few ideas to stay active all year long. Of course, always be safe by being aware of your own unique mobility limitations…and most of all, enjoy!